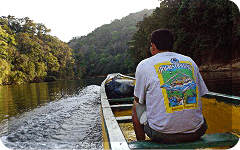 The Pacora River is located only about an hour drive from Panama City Panama, toward the northeast. 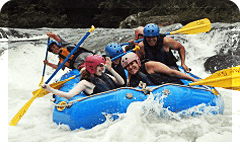 Kayak Panama White Water in this gorgeous river from July through November. It is very narrow and shallow in most sections but it is ideal for kayaking during the rainy season, from July to mid December. I has some challenging Class III rapids ( check Panama White Water Rafting Rapid Classification Here ) and two section to run it. The upper part, from Chapala to San Miguel takes around two hours and the lower part, from San Miguel to Carriazo takes around one and half hour. It does have some challenging rapids: "La Batidora", The Shaker, has quite a drop in a narrow, rocky, channel. You don´t want to take chances on flipping in this rapid, The Slalon is an easy adrenaline rush shute, some others make this trek a very fun ride. This trip is usually offered to groups on request and logistics are agree upon before trip date. WHAT DOES IT INCLUDE ? inflatable or rigid kayak, guides, and snacks. Our guides are trained in kayak navigation skills, first-aid and CPR. WHO CAN GO ? Any person from sixteen to sixty years old, in good health. Minors must travel with a responsible adult. WHAT SHOULD YOU TAKE ALONG ? A pair of short for navigating, sneakers or straped sandals, a cap, sun-block, a towel and dry set of clothes for the trip back.